This Artichoke Recipe could be used as an appetizer or a side dish with the main meal. Not too many people are familiar with cooking artichokes. But this easy recipe will have you sharing it with your friends and family at every occasion. 1- You need to match the number of Artichokes to the same number of people that you are trying to cook for. 2- If you find it necessary to cut the thorny tips, use a kitchen scissors to cut the visible ends of the petals and slice the top with a knife. But you can skip this step if the ends do not bother you. 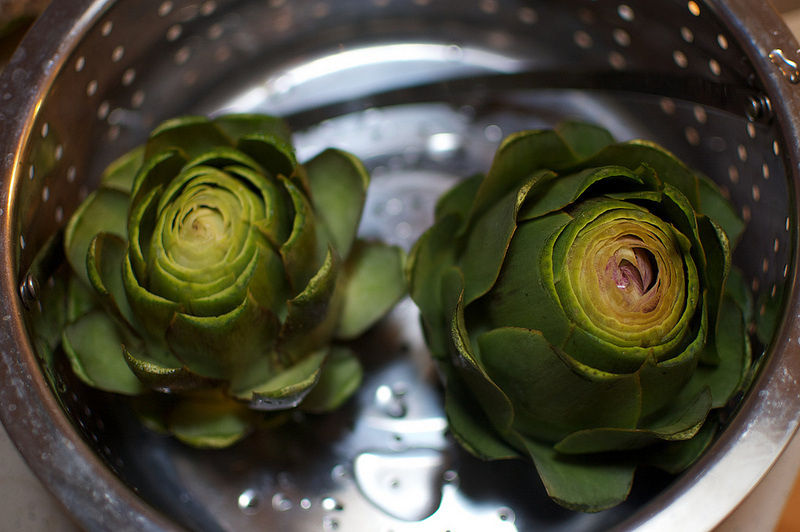 4- Once they're done; drain the Artichokes into a colander, and place them into cold water to cool down. 5- While the artichokes are cooling down, it is time to make the sauce. 3- Keep your fingers tightly holding the petal, and dip the pulled tender end into the sauce. 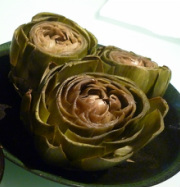 4- Scrape the tender artichoke flesh between your teeth, and discard the rest of the petal into the designated bowl. 7- Dip the cleaned heart in the sauce and enjoy!